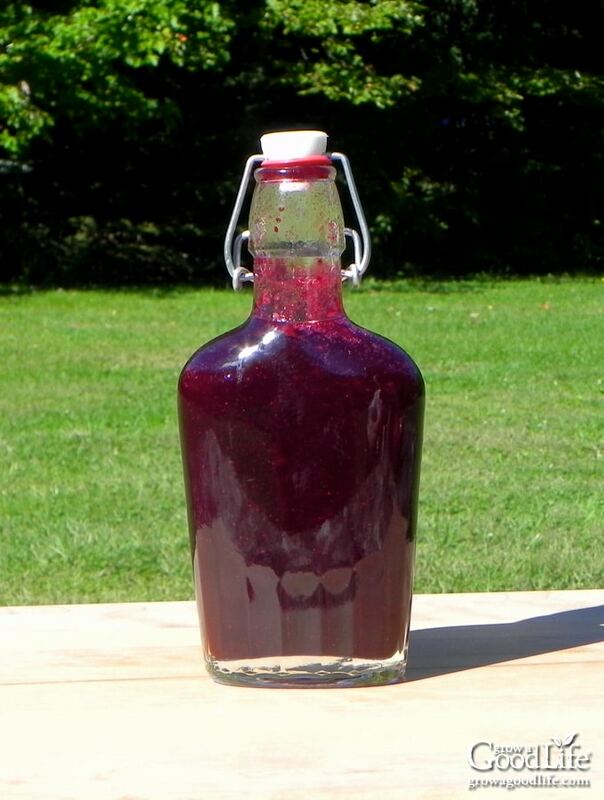 This homemade blueberry syrup sweetened with honey lets the true fruit flavor stand out. You can use fresh or frozen berries in this blueberry syrup recipe. Enjoy in tea, in yogurt, as an ice cream topping, or try a fruity twist on pancakes this weekend. We’re big fans of blueberries here in New England. While I was growing up, it was an annual family ritual to visit our favorite spots each year in late July through August and pick as many wild blueberries as we could in an afternoon. Many of these were eaten fresh or in a cup with a little milk and sugar. The majority of the bounty was frozen to enjoy all year. It was always a treat when my Auntie delivered freshly baked blueberry goodies. Our local picking grounds were along railroad tracks that cut into a granite hillside. Summer cottage vacations always seemed to have a patch of wild blueberries growing nearby too and I have warm memories of eating fresh blueberry muffins every morning during our vacations at the lake. Our acidic soil is the perfect environment for both wild and cultivated blueberries. Wild, lowbush blueberries grow in a dense carpet from underground runners or rhizomes. They tend to be found in dry, open ground, sunny meadows, down dirt roads, and along hiking trails. Blueberries are considered a “Superfood” and are packed with nutrition, antioxidants, and are a great source of fiber. Just one cup of raw blueberries provides 114 milligrams of potassium, 24% of the suggested daily intake of Vitamin C, and 14% of the recommended daily fiber. Antioxidants in blueberries include anthocyanins, which might help fight cancer and flavonoids that may improve learning and cognition. We didn’t know much about the health benefits of blueberries when I was a young. We just knew they tasted good and were a free source of fruit for our family to enjoy. It was also fun to forage for the ripe fruit and discover bushes heavy with berries as we scrabbled along the trails and brush. When we purchased our property, there were eight mature high bush blueberry plants lining the driveway. Like their wild counterparts, these plants require very little care and continue to produce pounds of berries each year. This year, the harvest began the last week of July and we picked every day for almost a month, ate our fill, and managed to stash some in the freezer to enjoy later. One of the things I experimented on this year is blueberry syrup. After a few batches and a few modifications, I am very happy with this recipe. We soon discovered that we also enjoy blueberry syrup with honey drizzled over warm pancakes, stirred in yogurt, and as an ice cream topping. I am sure we will discover other uses. Step 1: Peel several strips of zest from the lemon, and then juice the lemon. Set aside. Step 2: Juice the blueberries by combining them with water in a pot over low heat. Once the blueberries soften, mash them with a potato masher and stir and simmer until the juice is extracted. Strain the juice and discard the solids. Step 3: Add the juice back into the pan. Add the lemon zest and honey. Bring to a boil and simmer to thicken. 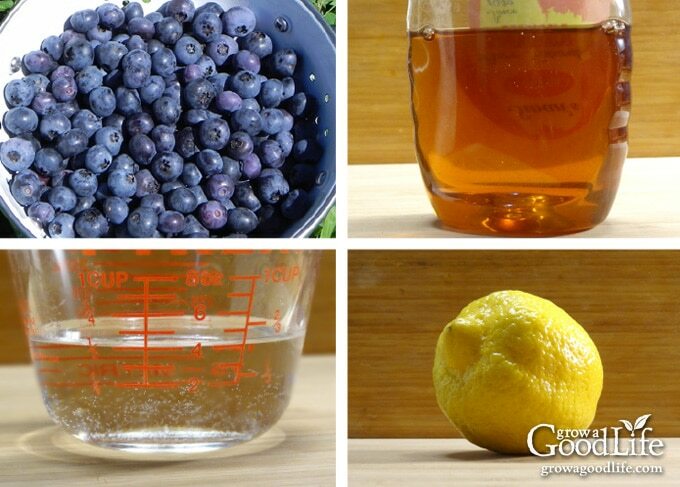 Add the lemon juice, boil for one minutes more, and then remove the blueberry syrup from the heat. Discard the lemon zest. Step 4: Serve warm or let the blueberry syrup cool, pour in to clean jars or bottles, and refrigerate. 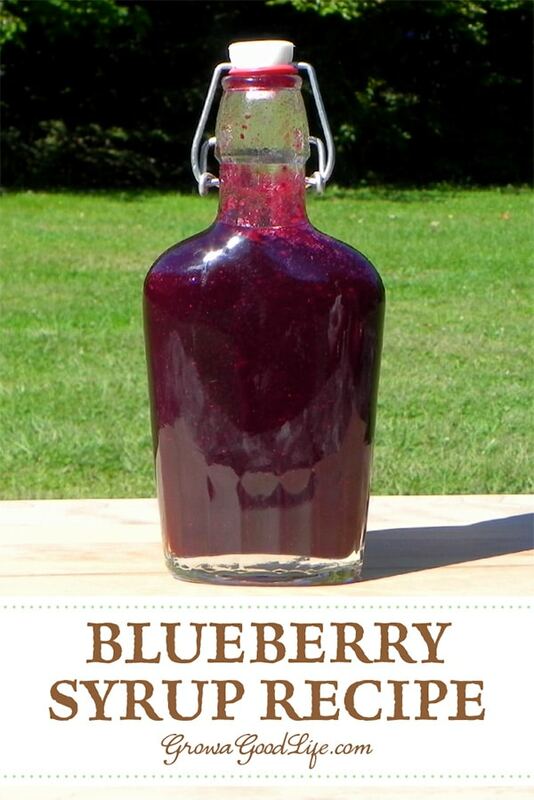 This simple blueberry syrup with honey recipe can be made with fresh or frozen blueberries. You can also use other varieties of berries such as strawberries, raspberries, blackberries, cherries, or a mix of berries. Using a paring knife or vegetable peeler, peel five 1-inch strips of zest from the lemon then juice the lemon reserving 2 tablespoons of lemon juice. Set aside. 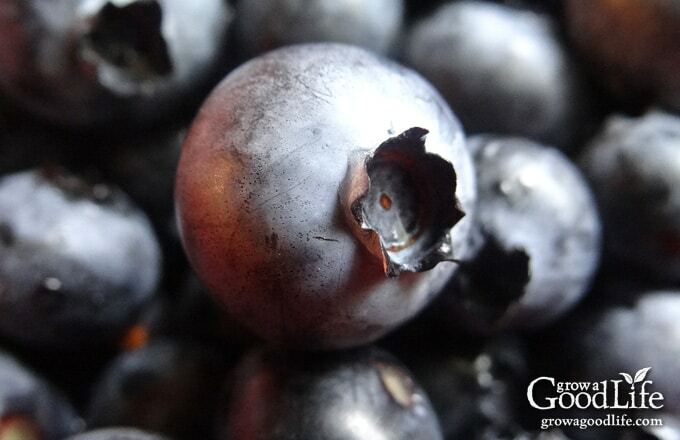 Extract the blueberry juice by combining blueberries and water in a saucepan over low heat. Gently mash the blueberries with a potato masher and simmer over low heat for 15 minutes, stirring occasionally. Strain the juice into a heatproof bowl, pressing hard on the solids. Discard the solids. Return the blueberry juice to the saucepan. Add the lemon zest and honey. Mix to combine. Add 2 tablespoons of lemon juice. Continue stirring and boil over medium-high heat for 1 minute. Remove from heat, discard lemon zest, and allow the blueberry syrup to cool. Pour into just-cleaned bottles. Cover and refrigerate. Use within 2 weeks. 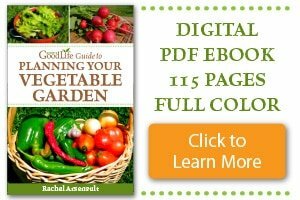 Are you interested in preserving a large batch? Then refer to this safe canning recipe from Ball. “Basic Report: 09050, Blueberries, raw.” National Nutrient Database for Standard Reference, Release 26. Web. August 2014. Prior, Ronald L. “Antioxidant Capacity and Health Benefits of Fruits and Vegetables.” USDA Human Nutrition Research Center on Aging. February 1998. Web. August 2014. Rodriguez-Mateos, Ana, Rendeiro, Catarina, et al. “Intake and Time Dependence of Blueberry Flavonoid.” American Society for Nutrition. August 2013. Web. August 2014. Awesome! Is there a substitute for the lemon? Something other than citrus as my sister has an acid reflux healthy issue. Giovanna, You can skip the lemon all together. 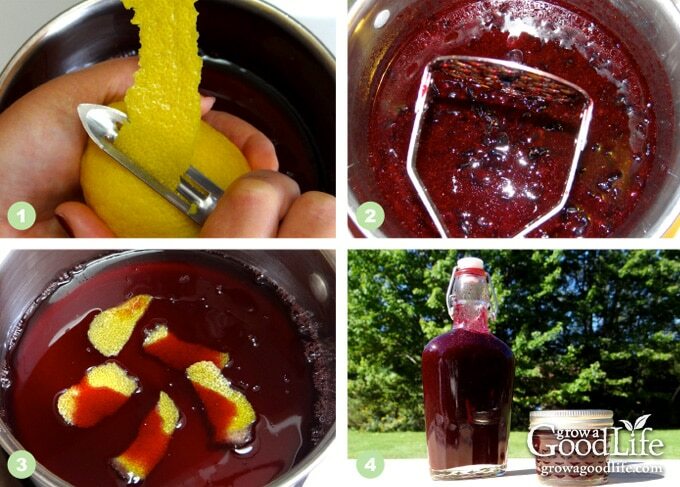 It is added to brighten the flavor of the blueberry syrup. It will still taste good without the lemon. What a great recipe!! I made it with blueberries, raspberries and strawberries and then added the syrup to Rooibod tea to make an amazing iced tea. Thanks for sharing! My favorite way to enjoy the syrup is in tea. There are so many possibilities with this basic recipe. This looks delicious!! I’m gonna try & make bread with the solids left over from cooking the fruit. This sounds so good! How much does the recipe yield and what size/how many jars or bottles do I need? This may be a silly question but how do you remove the zest at the end? Do you strain it again? Jen, Just pluck it out with a spoon or fork. Help….my syrup turned to jelly!…Any advice you can give on keeping it in the syrup stage is appreciated! Hi KJ! 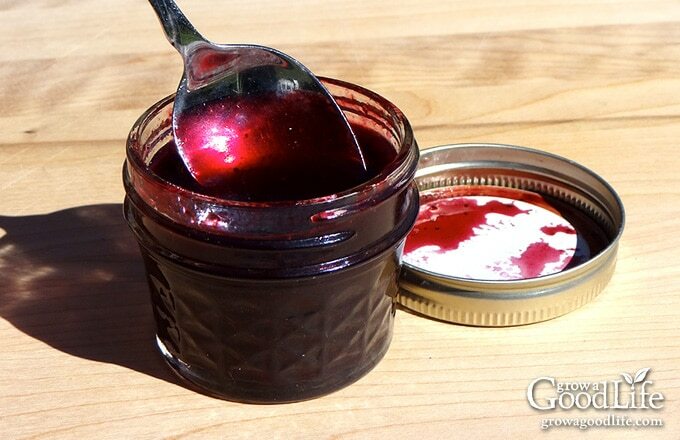 Try mixing equal parts jelly and water in a small saucepan and heat on low until the jelly is liquid. This looks so amazing! And I think would make wonderful gifts for birthdays and such. Would the recipe stay the same if you use blackberries instead of blueberries? Thanks so much! Rachel – thank you for getting back with me so quickly and I apologize. I was just now rereading all the info on your blog and saw where you did mention that it could be made with different berries, including blackberries. All I need now is the lemon and I’m set to go. Very excited about making this! Thanks for sharing your recipe with us….have a blessed day and week! Those times when the jams and jellies do jell, and we make syrup on purpose, we don’t strain it. We leave the berry chunks in. Yummy over ice cream or pancakes! In our area of Michigan, cherries in season are actually much cheaper than blueberries or strawberries, so cherries are our “everyday” jam and syrup. I have bookmarked and pinned this recipe for next year. My brother-in-law will be thrilled. No, you can eat right away. Once the jar is open, it is best to use up within a week or two since there are no artificial preservatives. Question: rather than throwing away the “solids” couldn’t got dehydrate them to use in muffins and pancakes? You can try it. I give mine to our hens. I just made this earlier today, and I have to say that it’s delicious! I decided to puree the blueberries down a bit using an immersion blender, but left it just chunky enough to tell they were once blueberries, hah. I did have trouble getting it to thicken for some reason, I used fresh local honey sourced from a friend’s father who is a beekeeper. Question, have you tried freezing any? I am wondering how it tastes after being frozen, I’d like to save some to have in the winter without having to actually can it. Brijcalvo, I am so glad you enjoyed the blueberry syrup. Our blueberries are just beginning to ripen and I can’t wait to make a fresh batch. As far as thickening, I have different results depending on the honey too. I have never tried freezing. If you try it, let me know if it works. Awesome! Who can resist this delectable syrup! My family would drizzle it on everything imaginable! 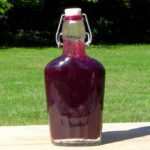 Thank you for sharing this healthy and delicious Homemade Blueberry Syrup recipe with us at the Healthy Happy Green and Natural Party Blog Hop! I’m pinning and sharing. I can’t wait to see what you share with us next! This looks so good! I love anything with blueberry. Thanks so much for sharing with us at the Merry Monday link party. I hope you’ll join us again this week. Sharing your post on Twitter! I love fruit syrups for pancakes. I’ll have to whip up a batch. I would never have thought about mixing honey with the blueberry. It sounds super sweet…..yum! yum! We just picked 60lbs of blueberries and my kids are wanting syrup. What a great recipe! Thanks for sharing on Real Food Fridays. Pinned & twitted. I have so many great memories of picking and eating blueberries. We would often go to the local pancake house where they always had blueberry syrup on the table. I think this is my year for making my own! Looks delicious!!!! How long can you keep it in the refrigerator? Jan, This syrup doesn’t last long in our house. Once opened, I would try using up within a couple weeks. That would be beautiful on pancakes! yumminess & healthy, too! i’m curious if i can keep the blueberries in the recipe? Joanna, Yes you can keep the blueberries instead of straining them out or even add additional whole blueberries to the syrup. Can this syrup be kept on the shelf and once opened refrigerate? That looks delicious and pretty simple! Thanks for sharing at the HomeAcre hop. Be sure to stop by at http://www.PintSizeFarm.com or one of the other hosts to submit another this week. Just a note to let you know that I have chosen your post as one of my features for this weeks Real Food Fridays that goes live tomorrow (Thursday) @ 7 pm EST. Thanks so much for sharing with all of us. Marla, Thank you so much for choosing this post as your featured post. I love blueberries and this syrup sounds delicious! We planted a Huckleberry this year and I’m wondering if I could do the same with it? Thanks for sharing with SYC. Pinned. Jann, I bet it would work with Huckleberries too. You may need to adjust the honey to your preferred sweetness, but I bet it would be good. the Healthy, Happy, Green and Natural Party Blog Hop. I appreciate it! Wow! What a great simple recipe. I love blueberries and honey. Thanks so much for sharing on Real Food Fridays. Have pinned & twitted. 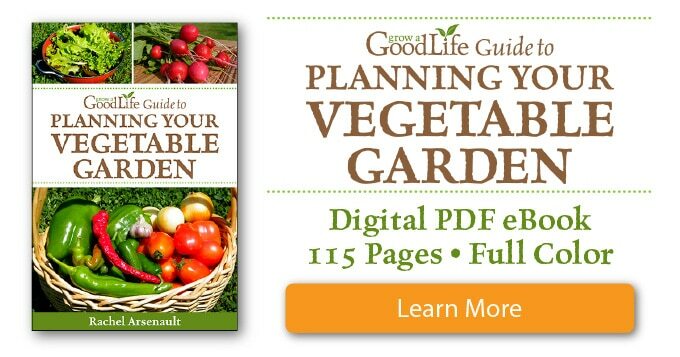 This is great – I just shared it on my facebook page for Garden Up green! Thanks for the recipe! I think my daughter would enjoy making this, and we have blueberries in the freezer. Pinning for later! I made this last year but never though about adding to my yogurt! What a great idea..thanks! I made a batch of this today. It’s so yummy! Thanks for sharing the recipe. Dave, I am so glad you liked it. It’s pretty easy to whip up a batch. Thanks for the invite, Jacquelyn! That looks so delicious. I love blueberries, but sadly can’t seem to grow them here. I do keep trying. Daphne, Frozen berries work too. You can also substitute berries. I can’t wait to try raspberry syrup.